Coca Cola has put Coke Zero to the test in “And”, a television commercial starring actor Chad Jamian Williams. Chad plays the part of a young man who has grown up knowing the power of the word “And”. A plain ice cream, with the word “And” leads to candy. A skateboarding dog with the word “And” leads to stardom. A job with the word “And” comes with shares. Service at the store leads to further service. 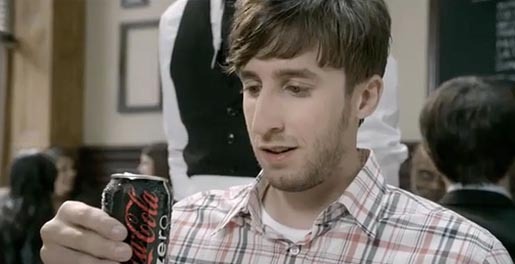 But when it comes to drinking Coke Zero, there’s only one word on Chad’s lips. The “And” commercial was developed at Crispin Porter & Bogusky, Boulder, by chief creative officer Rob Reilly, executive creative directors Dave Schiff and Alex Burnard, creative directors Matt Fischvogt, Shannon Mcglothin, art director Matt Kubis, copywriter Liza Behles, senior integrated producer Sloan Schroeder and producer Katie Porter, account director David Corns, management supervisor Christopher Schneider, content supervisor Drew Widell, content manager Kerstin Ulf, assistant content manager Josh Lybarger. Filming was shot by director Bryan Buckley via Hungry Man, Los Angeles, with director of photography Scott Henriksen, executive producer Cindy Becker, and line producer Mino Jarjoura. Post Production was done at The Mill, Los Angeles, by Flame artist Tara Demarco. Editor was Chan Hatcher at Number Six, with assistant editor Kyle Whitmore. Telecine was produced at New Hat. Animation was produced at Stardust, Los Angeles. Music/Sound Design were produced at Comma Music by composer Larry Pecorella and integrated music producer Jorge Vargas. Audio post production was done at Lime Studios.